I’m a big cheese lover and I’m a big Greek food lover. 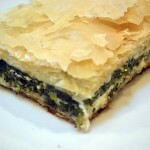 So it’s a natural fit to make this Greek delicacy, spanakopita, a Greek spinach pie. 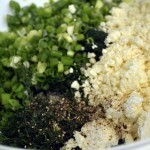 The ingredients are few, surprisingly, but the amount of work it takes is large. Well, let me correct that a bit. The filling is a piece of pie (see what I did there? 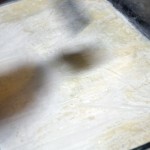 ), but preparing the crust – the phyllo dough – is much harder, even if you use pre-prepared sheets. For one, you need to brush butter on every layer of phyllo and place around twenty layers on the top and twenty layers on the bottom. It takes a while, so don’t be surprised. In fact, I recommend doing the bottom layer before any other work, just to save yourself some time later. Also be sure to have a brush handy. There isn’t really a tool you can substitute for a brush when you’re talking about a dough as light as phyllo. Is it worth the trouble? Absolutely. 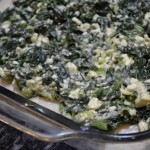 This recipe came out delicious, though I’d recommend either doubling the amount of filling (4 pounds of spinach!) or a smaller dish. Using a smaller dish isn’t too hard, if you get the right kind of phyllo. The pre-packaged phyllo I used was meant for a pan slightly larger than 9×13, but not large enough to fit the pan I ended up using. It was close enough though. 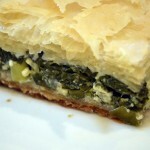 Also note that, because of all the butter between layers, spanakopita microwaves really well. Every layer comes to life and sizzles. So if you end up with left overs, just refrigerate. 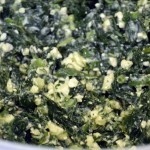 Blanch the spinach (see my instructions on how!) and place in large mixing bowl. Add all other filling ingredients and combine well. Lightly oil a 9×13 (or whatever size fits your dough) baking dish. Unwrap phyllo pastry and place half of the dough on the bottom of the pan, one sheet at a time, brushing each sheet with melted butter as it’s added. Place the remaining half of the dough on top of the filling, one sheet at a time, brushing each sheet with melted butter as it’s added. Sprinkle a bit of cold water on top to prevent burning. Bake for about 45 minutes or until the top is golden brown. Let me start by saying that lamb is an expensive, but delicious meat. Don’t expect to make this dish for cheap. 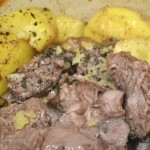 While this recipe is rather common and easy to make – found mostly in the villages of Greece – it tastes wonderful. If you ever find lamb on sale, I can’t imagine not buying it to make this delicious meal. Pre-heat the oven to 390°. Rinse the lamb portions and peel the potatoes. On a hard surface, wrap a potato in a cloth and crush it with a flat stone – I used a Dutch oven – but not completely. The potatoes should still retain most of their form. 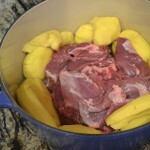 Place the lamb in the center of a Dutch oven, with the potatoes around it. Spread the garlic, oregano, salt, and pepper evenly over the entire dish. Place in pre-heated oven for 1 hour. 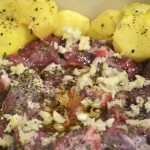 Remove from oven, turn both the lamb and potatoes over (plastic tongs work best for this) and remove foil. 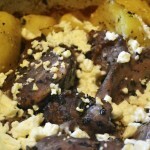 Spread the feta cheese evenly over the potatoes (optionally, spread it over the lamb as well). Put back into the oven for 30 minutes. It should color nicely.